The new 55,000 sq. ft. Fruita Community Center opened its doors in January 2011. Counsilman-Hunsaker teamed with architects Sink Combs Dethlefs to provide aquatic design expertise with the ultimate goal of creating the most exciting, entertaining, multi-purpose aquatic experience for city residents. The natatorium was designed to accommodate recreation and masters swim programs, with a 6,000 sq. ft. pool that offers five 25-yard lap lanes adjacent to a recreation area. Showcasing the combination of community members who will use the facility, the natatorium also features a recreation area with a climbing wall, vortex, current channel, waterslide and a 170 sq. ft. whirlpool spa. 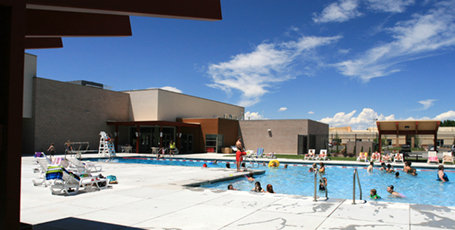 Beyond serving community functions, the center also serves the physical health of the community through its fitness facilities, including a gymnasium, running track, fitness area, senior areas, and a branch of the Mesa County Library. The new community center was built around an existing outdoor 4,000 sq. ft. lap pool which was completely renovated. Modifications to the outdoor pool included: new pool mechanical systems, new skimmer system, new quartz aggregate plaster finish, new tile trim, modifications to the main drain sumps to meet the Virginia Graeme Baker Act and a new ¾ meter diving board.